by MERKS: Day 43, outfit 43. Today, I'm wearing my peace t-shirt. 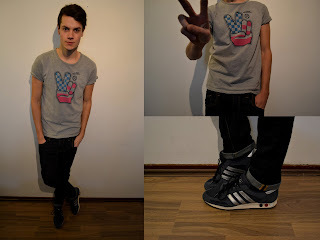 This one is from Jack & Jones, combined with a dark blue skinny jeans and my Adidas L.A. Trainers. GIVE LOVE AND SPREAD THE PEACE!